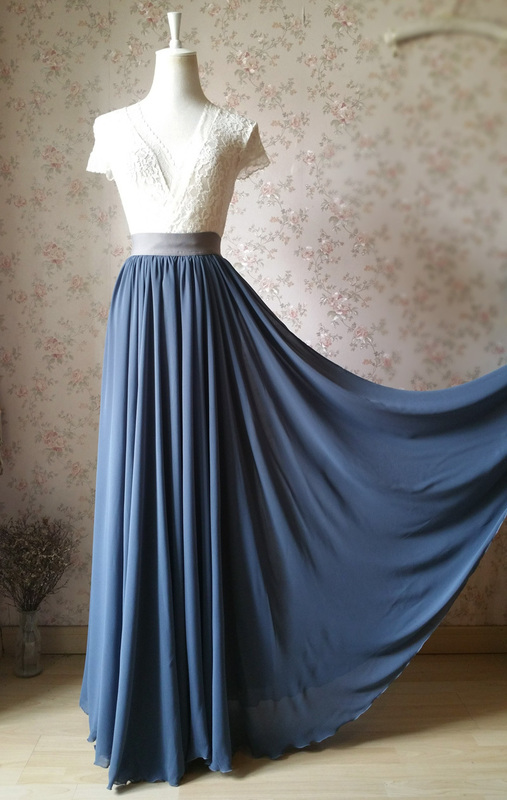 CHIFFON MAXI SKIRT, High Waist Dusty Blue Full Long Chiffon Skirt, Dusty Blue Bridesmaid Skirts, Chiffon Bridesmaid Skirt, Plus Size. This dusty blue is very beautiful and special color, we found this fabric for long time. Don't miss this unique chiffon skirt. 1) Length: We offer 5 skirt lengths, Please add the skirt length in the note for your order. - 100% top quality soft silky chiffon, which is nothing about ordinary chiffon. - Actually the big sweep is around 276 in, which is much more cloth than usual skirt. It's flowing when you moves just like a fairy. -Gray Waist band (Old version), which is very popular choice. For this gray waist band option, just add your request in the note while place order. -Elastic waist / full circle. - Over 100 colors for choices, please add the color number in the note while you place order. - Color sample available. Please check our listing about chiffon color samples for details. If you need assistance, please let us know. We'd love to help. - For color option from No. 01- No.11 with color block, we would make the matching waist band. And for other colors as the color chart showed, we only can find the black or white waist band to match it. For your consideration. Any other problem, please let us know. 7) Processing time: around 7 business days.